JetBlue and Virgin America have been sparring over customers ever since JetBlue failed to acquire its rival earlier this year. The skirmish started with JetBlue using free flights to woo disaffected Virgin America customers unhappy with its acquisition by Alaska. In return, Virgin America offered to match the elite status of any JetBlue TrueBlue member in Virgin America’s Elevate program. JetBlue then matched that deal. JetBlue’s latest offer, announced on Friday, raises the stakes. 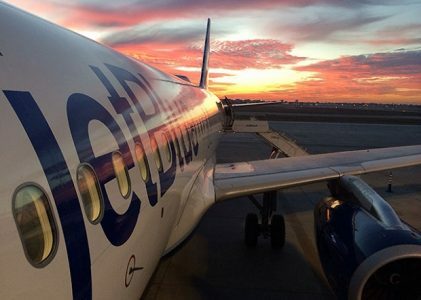 In a campaign called #goforthwithjetblue, the carrier is offering to match the balance of points from Elevate in TrueBlue accounts, in many cases, rounding up the mileage. The blog Point me to the Plane, which was one of the first to report on program, called the deal “pretty awesome,” while View From the Wing (VFTW) suggested it was the “deal of the year.” To read more at Skift, click here.